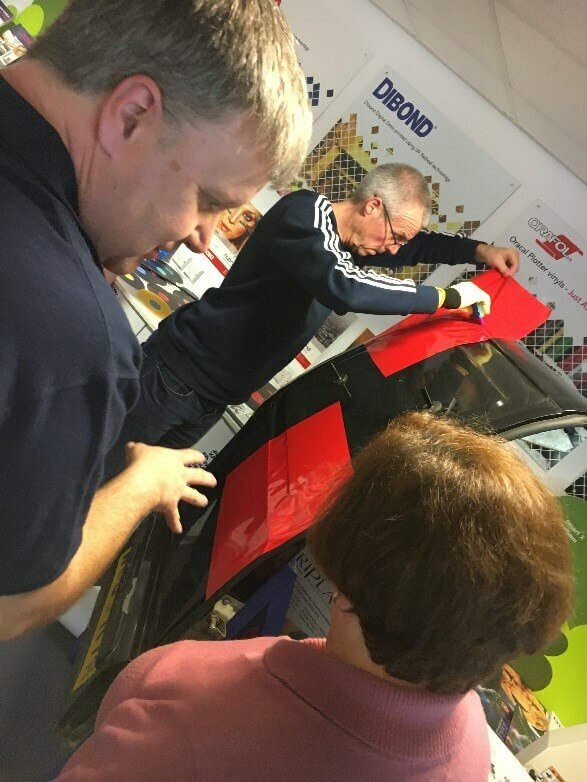 Once again, I had the delight of being taught by Paul Hughes, who started out in the sign business in 1988 – so you can imagine that we were in very good hands. In his own words Paul was “vehicle wrapping before vehicle wrapping was a thing”. Combined with his extensive experience, Paul has a friendly, easy manner which instantly puts you at ease. What seems to be a daunting task ,wrapping a vehicle, suddenly isn’t so bad. We spent the morning learning the theory behind vinyl application. In a short amount of time we covered all of the different types of vinyl available, as well as the adhesives. Paul gave us samples whilst explaining so that we could become familiar with them. As always, Paul wowed us with the microchannel adhesive which makes the painful task of getting rid of air bubbles, so much easier. He also explained how vinyl stretches, and why it is important to be aware of this. We went through the elements necessary before vehicle wrapping can begin. A sharp knife apparently is a very important tool… in vehicle wrapping, not real life. Having a clean environment is just as vital, however, it was an aspect that I hadn’t even considered beforehand. It soon became clear that this was not just sticking some material to a car – there as so much more to learn. A good heat gun and infrared scanner is also a must – nope a hairdryer simply won’t get hot enough, you will need a heat gun. There are three stages to conquer before you have finished a vehicle wrap. Once we understood the basics, it was time to put the theory to the test. We split up into teams of two, I’m assuming that for me especially, adult supervision was a must to ensure that I didn’t cut off my hand or burn the place down. Rest assured, I was well supervised. We started off by practising on cabinet door; you see wrapping isn’t only for vehicles. Once you get the vinyl application down to a tee, you can successfully wrap anything – the possibilities are endless. 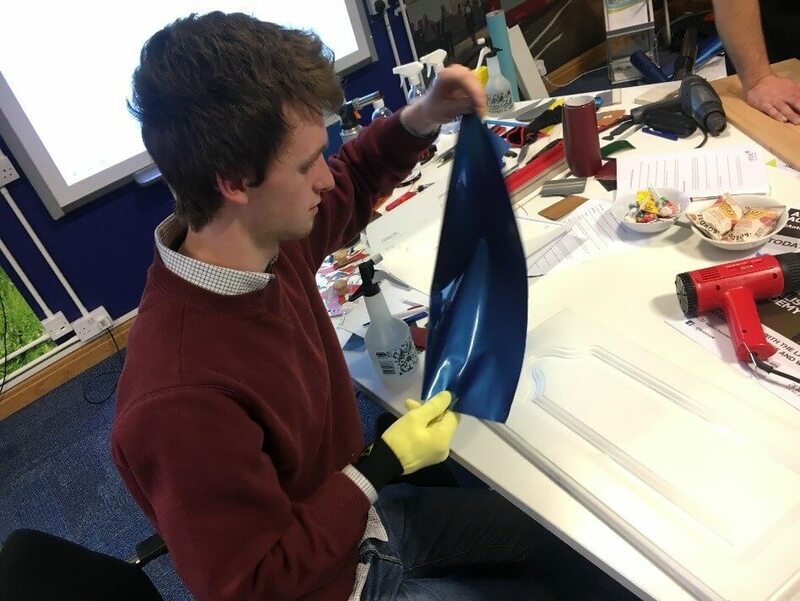 It was a good practical exercise, getting the vinyl to stretch around corners and down grooves, without ripping or stretching it too much. Once we’d successfully completed this we went onto the real thing. No we did not wrap a car each, for starters it would have been difficult to get them all into the Antalis Academy and also, we didn’t have the time. We stuck to wrapping sections of a vehicle door. So we gave it a try, saw what worked and what we did wrong. Tore off the vinyl and tried again. I have to say with this kind of vinyl application, you only get there by practicing. It was honestly so much fun that I think we were all fairly disappointed when the workshop came to an end. 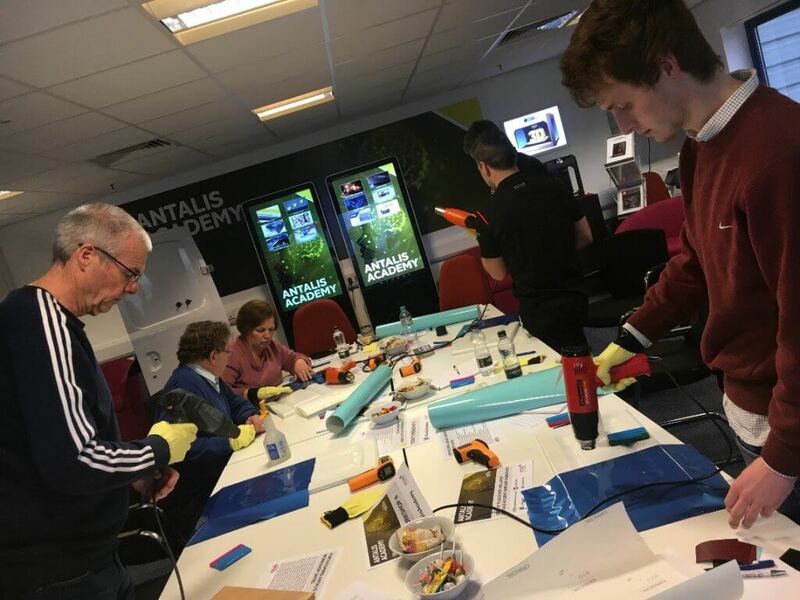 It was an incredibly interactive session and we all had a laugh – I couldn’t recommend this workshop more, even if you just want to learn how to give your kitchen a vinyl makeover.